The work of Post-Impressionist French painter Paul Cézanne can be said to form the bridge between late 19th century Impressionism and the early 20th century's new line of artistic inquiry, Cubism. The mastery of design, tone, composition and color that spans his life's work is highly characteristic and now recognizable around the world. 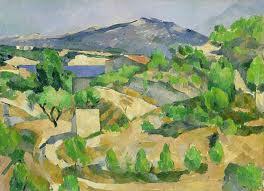 Both Henri Matisse and Pablo Picasso were highly influenced by Cézanne. 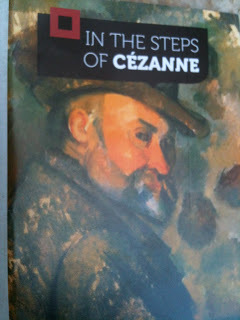 "I began the path to learn more about Paul Cézanne on the streets of Aix-en Provence. 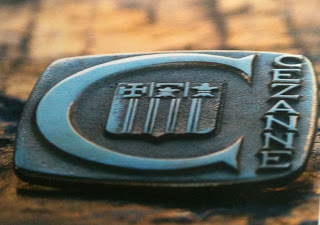 Following the bronze medallions embedded on the sidewalks, marking the steps of Cézanne's life in this old city that he was so passionately attached too." He summed up his love in one single sentence, "When you're born there, nothing else is good enough." He was born in Rue de l'Opéra in 1839 and died in Rue Boulegon in 1906. 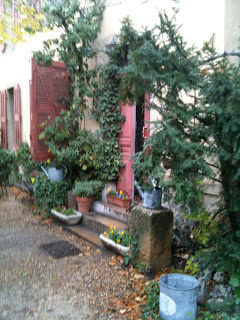 The particular light of Provence guided him on his creative path to the threshold of abstraction. In 1872 Paul Cézanne moved to Pontoise, where he spent 2 years working very closely with Pissarro. During this period Cézanne became convinced that one must paint directly from nature, with the result that romantic and religious subjects began to disappear from his canvases. In addition, the somber, murky range of his palette began to give way to fresher, more vibrant colors. As a direct result of his stay in Pontoise, Cézanne decided to participate in the first exhibition of the Société Anonyme des Artistes Peintres, Sculpteurs et Graveurs in 1874. This historic exhibition, which was organized by radical artists who had been persistently rejected by the official Salons, inspired the term "impressionism"--originally a derogatory expression coined by a newspaper critic. "Visiting his private studio was an inspiring experience. Located up above the city on the Lauves Hill, I walked in the woods behind his studio, understanding completely his need for quiet solitude. This place allowed him to paint in the style he became known for but not highly respected for during his lifetime." 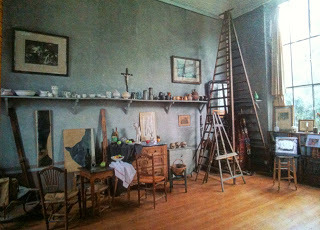 From 1904 until his death in 1906 Cézanne worked every morning in this studio of light and silence, the birth place of dozens of paintings that are now owned by the worlds greatest museums. His studio was preserved until 1997 by a foundation created by 2 American collectors. "I was surprised to find that Aix owns only 4 small original paintings, as his work was not collected locally. However, Paris and New York Museums have large collection. Here among the objects he treasured and used for his paintings, his furniture and painting smocks covered with oil paint, his brushes and painting tools, I felt time stop! and I did feel Cézanne's energy intensely in the room.Notice the small table in the center, set with fruit and bowls, now look at the fruit painting." He painted directly from the subject and employed the short, loaded brushstrokes which are characteristic of the style as it was forged by Monet, Renoir, and Pissarro. Paul Cézanne's insistence on the integrity and uniqueness of painting as a medium has additionally meant that the demands of visible reality must ultimately give way when they meet the demands of the pictorial surface. This was a crucial step in the development of abstract art in the 20th century. After 1877 Cézanne gradually withdrew from his impressionist colleagues and worked in increasing isolation at his home in southern France. This withdrawal was linked with two factors: first, the more personal direction his work began to take, a direction not basically aligned with that of the other impressionists; second, the disappointing responses which his art continued to generate among the public at large. In fact, Cézanne did not exhibit publicly for almost 20 years after the third impressionist show.